Buy this item and earn 35 points valued at £0.35. 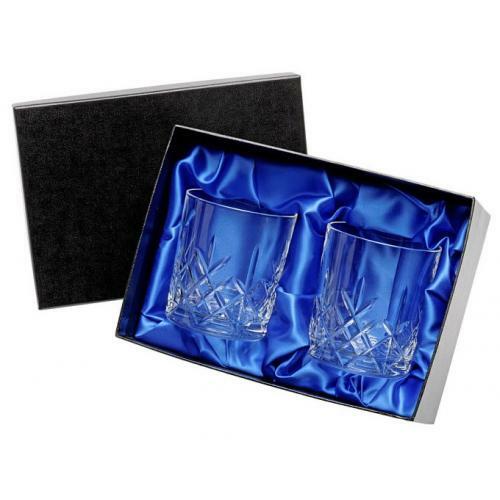 These quality cut glass whisky tumblers weigh 400g each and are reassuringly weighty to hold. The diamond pattern cut into the straight-sided glasses includes a blank panel for engraving, and these 320ml tumblers are perfect engraved as personalised gifts, commemorative awards or as corporate branded items. We offer free engraving so you can add a name, message, corporate logo or club crest at no extra charge. By default, both glasses will have the same engraving, but if you wish to have different engraving on each one just let us know in the comments section.